The beauty of cotton labels is its luxury made light; and the casual, timeless look of its natural materials. The environment-friendly and simplicity style of cotton labels is the best clothing label for lifestyle apparel. With thanks to Karen from HUERS Clothing for her feedback after she carried out a recent test from the purchase of some printed cotton labels. As with all of our labels we recommend customers test them for their garment before using the label further. As a result of the different fibres used in the weave of a garment label it is very important that they are checked and tested for the specific use on the garment they are to be sewn or attached to. It is likely that printed cotton label after warm water machine wash, might shrink on the length sides of the label. We like to take this opportunity to explain how printed cotton labels are made, and why it shrinks only on certain sides of label after machine warm water wash.
To understand why cotton labels shrinks in warm water machine wash, let’s look at the property of 100% pure cotton fabric at first. The materials of cotton fabric is made of cotton threads that are woven together by a loom machine. The cotton materials themselves and the way they’re combined together create a distinct type of cotton fabric. 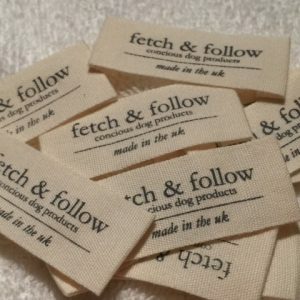 For example, the materials of the three cotton fabric labels that we provide; lightweight soft cotton labels (for baby clothes), heavyweight cotton labels (canvas labels for denim clothes), and less-density-weave herringbone cotton labels; these are three very different type of cotton fabrics labels. Heavyweight cotton labels (canvas labels ) is much heavier because its woven with a twill weave to create a more durable fabric, while lightweight soft cotton and less-density-weave herringbone cotton fabric labels use a plain weave resulting in a lighter, airier cotton fabric. Their primary differences are due to the way they’re woven together and how tight the weave is. Cotton is highly susceptible to shrinking at high temperatures due to its nature of earth-friendly material. The cotton fabric ribbon that we produced at the first place has already been pre-washed and gone through the shrinking process before we print the labels with customers’ design artwork on it; therefore cotton label will not shrink on the wide sides of the ribbon (which are the narrow-woven-edge sides). You need to see which sides are the width of ribbon on the label itself; the likely shrinking sides are the sides with cutting and frayed edges. In the case of Karen’s printed cotton label (80x80mm), the shrinking is on the wide sides of label, which is the length side of cotton ribbon. The 100% pure cotton, and nature-friendly cotton label does shrink about 2 – 3% in machine wash at 30-40 degrees. Using cold water can minimize the shrinking. The more density textured weaving cotton fabric (such as heavyweight canvas cotton fabric labels) can shrink more, about 5%. The less density textured weaving such as herringbone cotton label is about 1 -2 % (about 1mm shrunk on the length sides of cotton ribbon). We print customer’s design artwork onto above-mentioned cotton fabric ribbons, and then we cut and fold each label off the cotton fabric ribbon. Most of our customers do not see the difference (unwashed and washed) if their label dimension is a standard size, or smaller size labels. But if your cotton label is a big label such as 80x80mm, then you can see this 4 – 5% shrinking after machine warm water wash; it is especially obvious on the heavyweight canvas cotton labels. If your garment requires high temperature machine wash, and if the shrinking of this 100% natural cotton label is no good to your product, we would suggest you to purchase woven polyester label, or the coated slit-edge cotton labels. Under the natural conditions, the 100% pure cotton fabric label does shrink in machine warm water wash. Please do carry out your own wash test before ordering 100% cotton labels from any labels suppliers, to ensure that you receive the desired machine wash results.